Nel 1988 - 14 anni dopo l'uscita di Eldorado - una paio di scarpette rosse sono andate all'asta e battute per $ 165.000. L'episodio é raccontato nei dettagli da chi lo ha vissuto di persona e NON ha vinto la gara: Jonathan Walford, all'epoca curatore del Museo Bata e autore del libro "Shoes A-Z" (L'Ippocampo - 2010). Walford ottenne dal Museo la disponibilità per soli $ 25.000. 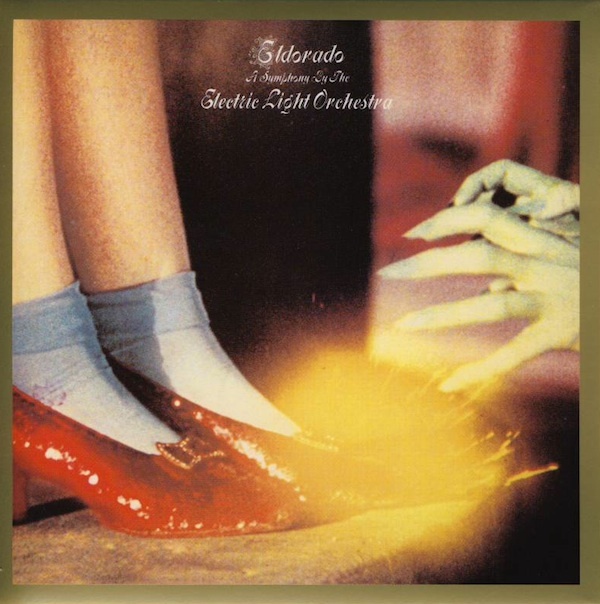 Back in 1988, fourteen years after the "Eldorado" release, a pair of Garland's ruby slippers went on auction and sold for $ 165,000. The event was witnessed by former Bata Museum's curator and "Shoes A-Z" author Jonathan Walford who was there to bet with a budget of $ 25,000 on behalf of the Museum. La notizia é che un'altro paio di scarpette rosse utilizzate da Judy Garland andrà all'asta il 16 dicembre 2011 a Los Angeles: appartiene alla vasta collezione di Joe Maddalena (titolare della Profiles In History) e la base d'asta é fissata tra i 2 (DUE) e i 3 (TRE) milioni di dollari. Nel frattempo, una variante delle scarpette rosse (conosciuta come Arabian-pattern test), appartenente all'attrice Debbie Reynolds (Singin' In The Rain, In And Out) é stata venduta lo scorso giugno per soli $ 612.000 partendo da un prezzo iniziale di $ 150.000; nel film non appaiono, ma sono state utilizzate per due settimane durante le prove e ritenute non adatte. 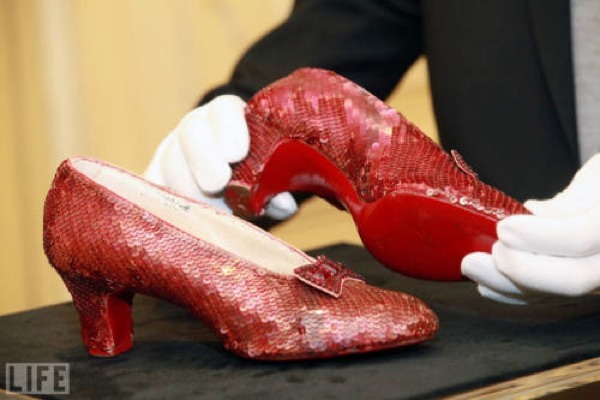 Now, another pair of ruby slippers will be auctioned the coming December, 16 in L.A.: it belongs to the collection of Profiles in History's owner Joe Maddalena and the shoes are expected to fetch between two and three million dollars. 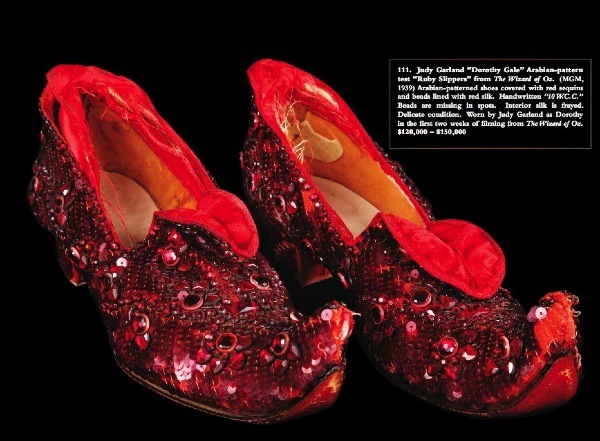 Meanwhile, a variation of the ruby slippers, know as the Arabian-pattern test, from the collection of actress Debbie Reynolds (Singin' In The Rain, In And Out) was sold in June 2011 for only $ 612,000 ($ 150,00 the starting price). They were used for two weeks on screen tests but never appeared on the movie. Una domanda: ma quante paia ne sono state prodotte? Quattro, secondo Vogue.it che replica l'errore di StyleIte.com, ma é un dato sbagliato: in realtà il numero risulta variabile - a seconda della fonte - da 5 a 8. Un'ultima cosa: anche le scarpette di Judy Garland hanno la suola rossa, solo che lo sconosciuto artigiano che le ha prodotte non ha fatto causa a chi lo ha copiato qualche decennio dopo. La storia completa delle scarpette rosse la trovate qui. One question: how many pairs of slippers have been produced? Four, according to Vogue.it, probably misled by the same mistake made by StyleIte.com. Actually the right number is in debate ranging from five to eight pairs. 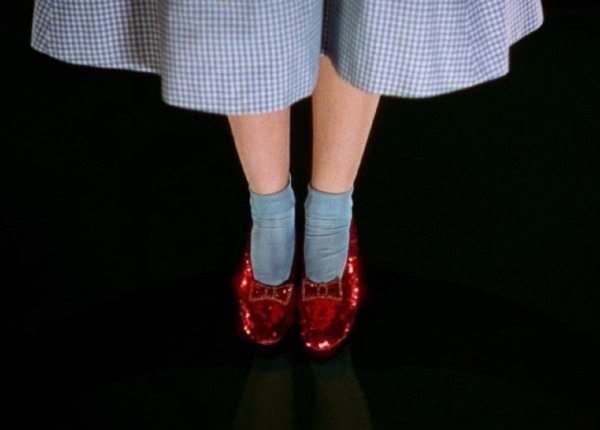 One last thing: even the Judy Garland's ruby slippers sport the red sole, only the unknown artisan who made them didn't sue the guy who copied the style a few decades later. 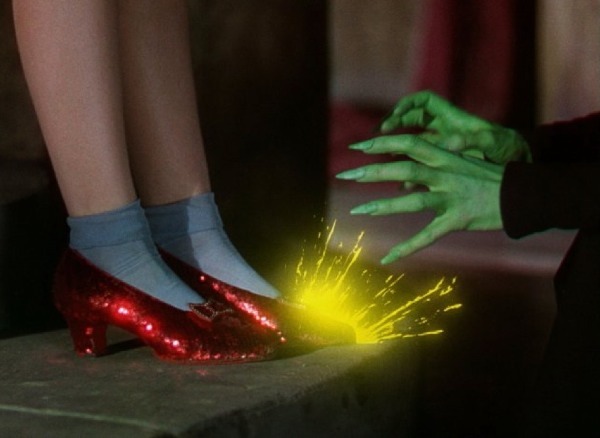 The whole story about the ruby slippers is here.